The Jaybird Tarah maintain what we love about the X4's, including their IPX7 rating. While they're lacking in some areas, the price being $30 cheaper makes them worth it in our opinion. If true wireless is your thing, the $49 JLab JBuds Air are hard to beat. These earbuds aren't just the best bang-for-your-buck workout earbuds, they're the best bang-for-your-buck true wireless earbuds. If you don't want to spend too much but still want a solid pair of neckbuds, the SoundPeats Engine should be on your shortlist. These true wireless earbuds can effectively be used by triathletes and anyone who wants to remain aware of their surroundings at all times. The downside of this awareness, though, is a drop in sound quality. Bose's take on true wireless is going to cost you. In return, you get a great fit, tactile controls, and superb sound quality. Exercising is tough, but finding earbuds that keep up with you shouldn’t be. That’s why we’ve compiled a list of the five best workout earbuds money can buy. We hope that these push you through even the most strenuous workout regimen. This list was updated on April 10, 2019, to include new notable mentions. Jaybird has gone through a few versions of its product, and the X4 was the best yet—until it released the Jaybird Tarah just a few weeks later. While the X4 is technically the better pair of ‘buds, the differences are slight and if you go with the Tarah earbuds instead you’ll be saving yourself about $30 which we think is a fair trade for only two hours less of battery life. Plus, the Tarah has the best feature of the X4 which was the IPX7 waterproof rating. Worth noting, like the previous iteration, the charging module must be connected to the proprietary charging dock. You can’t just connect a directly to the Tarah. Unfortunately, the process can be a bit finicky when compared to the typical micro-USB charging port, but it looks futuristic and works. Just don’t lose the dongle. Battery life is ok. During our objective testing, which subjected the Tarah’s to constant playback at 75dB(SPL), we squeezed out just under 7 hours of juice. Admittedly, this could have been improved upon, but it should cover a week’s worth of workouts for most of us. And after polling Android Authority readers, we found that most of you only listen to music for one or two hours anyway. What the Jaybird Tarah lacks in stamina it makes up for in sound customization via EQ settings in the Jaybird MySound app. You can save your preferred profile to the headphones and apply it to any device that the Tarah connects to. Sure, you can go with the Jaybird X4 if you really want those extra two hours of battery life and some more customizable ear tips options, but we’d say just save yourself the money. Gym rats. Sure, you may already have Bluetooth earbuds, but if they’re not sweat-resistant, I’d caution against using them during vigorous training sessions. The listed earbuds have all been tested firsthand by various members of the SoundGuys team, and we can attest to each product’s durability. Sure, the Crazybaby Air 1S look nice and are IPX6-rated, but they fit poorly and offer lackluster battery life. This, unfortunately, knocks them out of the running as the best workout earbuds. What’s more, if you’re just the average consumer looking for your next pair of wireless earbuds, any of these are a great option. It’s important to make sure that your earphones are water-resistant—accidents happen. At the very least, an oleophobic coating can go a long way. See: What makes a great pair of workout earbuds? If you’re an exercise enthusiast who has tried out a few pairs of true wireless ‘buds, then you may be familiar with how poor fit and battery life make them hard to choose over traditional Bluetooth earbuds. That said, the JLab JBuds Air are the true wireless earbuds to take for a spin. With IP55 certification, the JBuds Air is dust- and water-resistant. This means that no matter how hard you sweat or if you drop them in the sand during a run on the beach, they’ll hold up without a problem. In addition to the IP55 rating, you get one-touch access to your respective virtual assistant. And the package includes proprietary Cush Fin ear tips, which allow for a stable fit that can endure the most vigorous of workouts. The bulk is a downside, but it’s easy to ignore because the fit is so good and the earbuds so light. Although there are plenty of great headphone options for the gym on this list, they can get quite pricey costing you upwards of $100. Sometimes you don’t want to invest so much into something that’s going to get beat up as you sweat into them. That’s where the SoundPeats Engine Bluetooth ‘buds make their mark. These neckbuds will only run you about $35, but you probably wouldn’t guess they were so affordable if you just look at the spec sheet. These feature Bluetooth 5.0, an IPX6 water-resistant rating, aptX and aptX LL support, and even a solid battery life of around 12-13 hours. Of course, they’re not perfect and sound quality isn’t the greatest. Plus, exercising with a pair of neckbuds could be a little weird especially when running because, as Lily noted in her full review, they do a lot of flopping around on your neck. That said, she never felt like they would come out of her ears thanks to the earbuds having such a great fit. Each of the earbuds also has a magnetic backing so you can nap them together securely when not in use, making them a great option for the gym or just for your daily commute. Let’s be honest, for around $35 these are a steal. A proper fit is key to excellent workout earbuds. Thankfully, most companies provide you with multiple sizes of ear and wingtips for extra security. For some, ear tips like this can be unwieldy and actually undermine a solid seal. This was an issue for me when I used the original Jaybird X, so I chose to forgo the wing tips and continue to love the earbuds. If your earbuds are falling out too often or hurting your ears, try altering the sizing or ear tip style. Different wing tip shapes and textures make a world of difference when it comes to comfort and stability. There’s also Bluetooth codec support. If you have no idea what that is, don’t worry we have an entire podcast explaining it (did I mention we have a podcast?). Basically what you need to know is that two devices need to have the same codec in order to transfer information between them. Think of it kind of like a language. If two people speak the same language, information gets passed between them quicker than two people gesturing at each other. The same is true with codecs, and if two devices have the same codec information is passed quicker than two that don’t. Unfortunately, not all codecs are equal and some are better than others. While this isn’t a huge deal for workout earbuds since you probably aren’t going to be doing any critical listening while doing your squats, it’s still something to take note of. Additionally, a key aspect of the listed best workout earbuds is that they’re, at the very least, sweat-resistant. So here’s a quick rundown of Ingress Protection (IP) ratings and fit. IP57-rated, these earbuds can be submerged to depths of one meter for up to 30 minutes. Naturally, the dust-resistance and water-proofing make the BackBeat Fit 3100 a sturdy pair of truly wireless earbuds, and the flexible earhook design means that they remain stable during vigorous movement. Note: the fit does require some getting used to as the Ambient Aware ear tips, which allow listeners to remain aware of their surroundings, don’t create a cogent seal. Don’t be fooled, though; the ear hooks keep everything in place. The touch capacitive panel set on the left earbud adjusts volume while the right earbud houses the same holographic panel that acts only as a button for playback and call controls. These comprehensive onboard controls are useful when in the middle of an intense workout: the last thing you want to think about is where your phone is to switch a song. Advanced Bluetooth codecs aren’t supported by these earbuds but, again, that’s fine for working out. If you’re striving for the best sound quality, you’re going to get something that seals to your ear canal anyway. Overall these are an appropriate pick for runners, cyclists, swimmers, and even skateboarders, so long as you don’t mind how they protrude from the ear. Bose hopped onto the true wireless train with the SoundSport Free, an update to the SoundSport Wireless. With Bose’s patented StayHear+ ear tips, the bulbous ‘buds remain in your ears during the most vigorous of workouts. I was able to squeeze out five and a half at 50 percent volume, and the matte black case provides an extra 10 hours. During our objective testing at a louder 75dB(SPL), however, constant playback time came out at 4.58 hours. Just like their predecessor, the SoundSport Free earbuds sound great; though, the low end is under emphasized for sport-oriented earbuds. What’s more, athletes retain full control of the music with traditional playback controls and a multi-function button. Plus, if an earbud is lost, the Bose Connect app attempts to locate it. All of these features in addition to the great overall sound make the SoundSport Free a pair of the best workout earbuds on the market. Rowkin Ascent Micro: If you want a pair of true wireless earbuds but don’t want to spend too much, then Rowkin Ascent Micro is worth looking into. They offer 3.17 hours of constant playback, touch controls, and an IPX5 build. Jabra Elite 65t: This used to be the best pair of true wireless workout earbuds available until the cheaper JLab JBuds Air entered the market. The earbuds are IP55-rated and feature a 5.85-hour standalone battery life. Bose SoundSport Wireless: These earbuds are the traditional Bluetooth version of the Bose SoundSport Free. Aside from the varying wireless technology, it’s virtually the same. 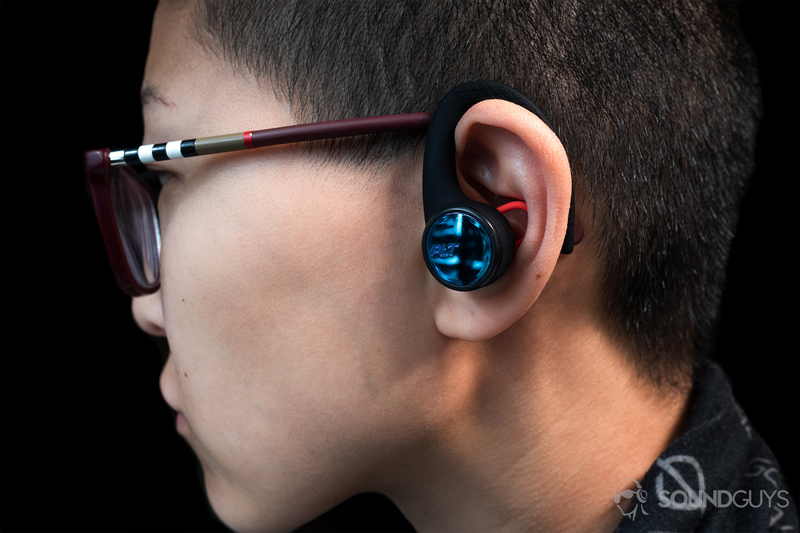 Optoma NuForce Be Sport4: If you need something under $100 that includes AAC and aptX support in addition to being IPX5-rated, this is as good as it gets. V-Moda Forza Metallo Wireless: This neckband-style pair of wireless headphones is outfitted with a sweat-resistant coating and maintains a stable connection for long workouts. 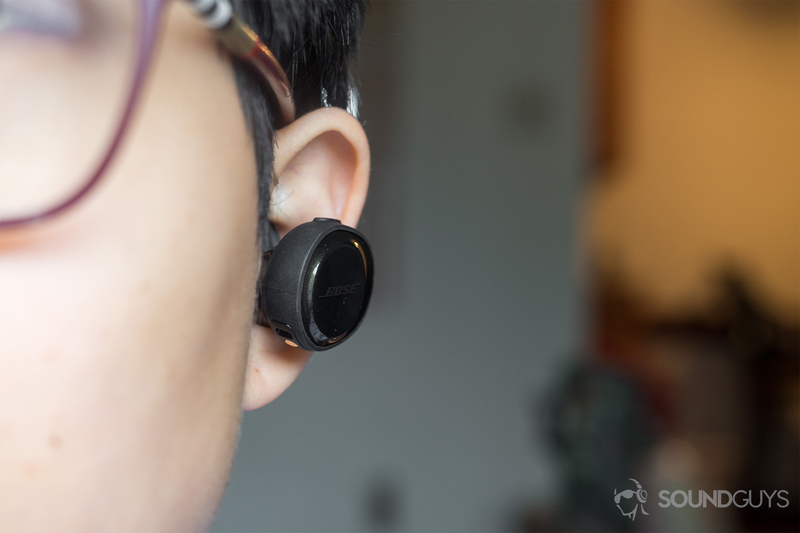 Anker Soundbuds: This is similar to the Aftershokz Trekz Titanium but the connectivity is less stable. However, it’s are more affordable. Fitbit Flyer: It’s like the Bose SoundSport Wireless but lacks the Bose’s IPX4 rating. BeatsX: If you need something stylish and chic, this is a great choice. But be wary because the earbuds aren’t officially IP-rated. See our comparison of the BeatsX, Beats by Dre Power Beats, and the Apple AirPods. JLab Epic Air Elite: These share a similar build to the Plantronics BackBeat 3100; however, they’re not water-resistant and feature a more streamlined design. We’ve reviewed our share of products at SoundGuys, which makes it easier to determine what the best workout earbuds available are. However, we aren’t superhuman and admittedly haven’t reviewed every product out there, but we have done our research and all top five products and notable mentions. The JLab Fit 2.0 and Epic Air Elite are both workout earbuds, but the Elite is a true wireless model with touch controls. For this list, I was able to test our curated selection of models. I also used these casually around the house, in the office, and generally while out and about. When testing earbuds for workout purposes, I do a bit of cardio, mainly biking and running paired with weight-lifting and calisthenics. All the products listed were able to withstand my workouts. Since there are so many options out there, it’s possible that we missed something. Fortunately, these best lists are constantly updated as we come across new information, so don’t be surprised to see them change a few times a year. We buy the vast majority of our products for review—that way, we go through the same experiences that you do when you buy. We subjected the nominees to our objective testing which includes isolation, battery life, and frequency response. You can read all about it here, but the truncated version is as follows. We use objective readouts to determine the earbuds’ frequency response. Each product was subjected to multiple sine sweeps through the headphones, and we recorded the frequency response once we were able to repeat a result that demonstrates the hallmarks of a good seal. For battery testing, we used a real-time analyzer to calibrate the necessary setting for a 75dB(SPL). We then played infinitely looped music until the battery ran out. This lets us compare each product’s readout to the others. With the isolation tests, we used pink noise at 90dB(SPL) and set the speaker one meter away from the headphones. We first recorded with the headphones off and then with the headphones on. From there, we just subtract one from the other to get the isolation. The three of us are fully committed to SoundGuys and working here is each of our nine-to-five jobs. Collectively, we have multiple years of reviewing audio products under our belts and are able to keep pace with the ever-changing world of audio. That way, we can easily separate the diamonds in the rough from, well, the rough. We make sure to test as many best workout earbuds contenders as possible, so you don’t have to. At the end of the day, we want you to enjoy what you listen to, which means we want you to enjoy what you’re listening through. None of us see a dime from partnership deals or referral purchases, and we absolutely don’t benefit from swaying to one product or another. If you’re interested in learning more about our ethics policy, click here.